Hang out around Volendam fishing village after lunch at De Koe Restaurant. 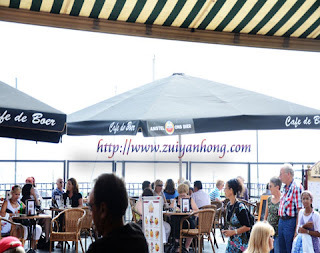 There are quite many cafes in Volendam fishing village. Stop at a cafe to find out the price of the coffee. Aiyoyo! The price of cheapest coffee was 6 Euro. We proceeded to another cafe. I am not familiar with the name of the coffee. So I just pointed at the menu to the waitress. Shortly, the waitress served a glass of fragrant and colorful coffee. I sipped the coffee. Wow! The coffee was truly tasteful and aromatic. Looked at the menu again, the glass of coffee was latte macchiato. 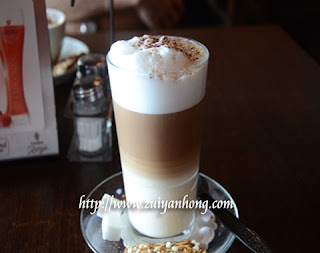 The price of this glass of latte macchiato is 2.5 Euro. 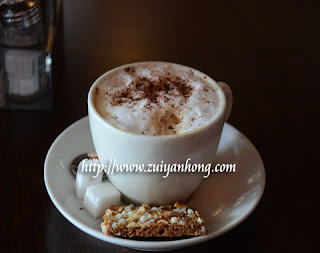 My wife ordered a cup of cappuccino and kept on nagging the price of the cappuccino was too expensive. Since enjoying coffee in Europe, I am addicted to coffee and started to search for the information of coffee. The kitchen of my house is full of many containers for filling various types of coffee powder.